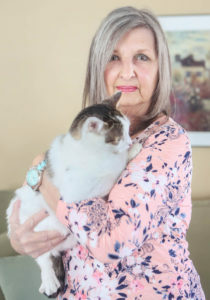 Once upon a time, Lynn True was lonely without a cat. In June 2016, her cat of 18½ years passed away. Since she was planning a trip to Alabama to visit friends in October, True told herself she wouldn’t browse any websites for cats until she got back, not wanting to leave a newly adopted pet behind. True knew she didn’t want a young cat, and at 13 years old, Molly certainly wasn’t a kitten. But after meeting her at the APA in August, True came back for Molly just a few days later. She ended up not going to Alabama, since she was a cat mom again. Molly is a cuddly senior kitty, and she and True curl up in the living room together and watch TV. When she first brought Molly home, True says Molly was getting sick daily, and she couldn’t figure out why. True discovered the cat had been eating plastic: grocery bags, casings for water bottles and so forth . “Now, she’s on a plastic-free diet!” True says with a laugh. One of Molly’s favorite things is a box she discovered when she first came home with True. True had brought up a box of things from the basement and set it down in the living room. Molly has since claimed the box as her own, running to it whenever she’s alarmed or if she hears the mailman come to the door. But when True has visitors, Molly has to be right in the middle of everything, going from lap to lap and getting as much attention as possible. FOR YOUR OWN FAIRY-TAIL ENDING … VISIT THE APA!